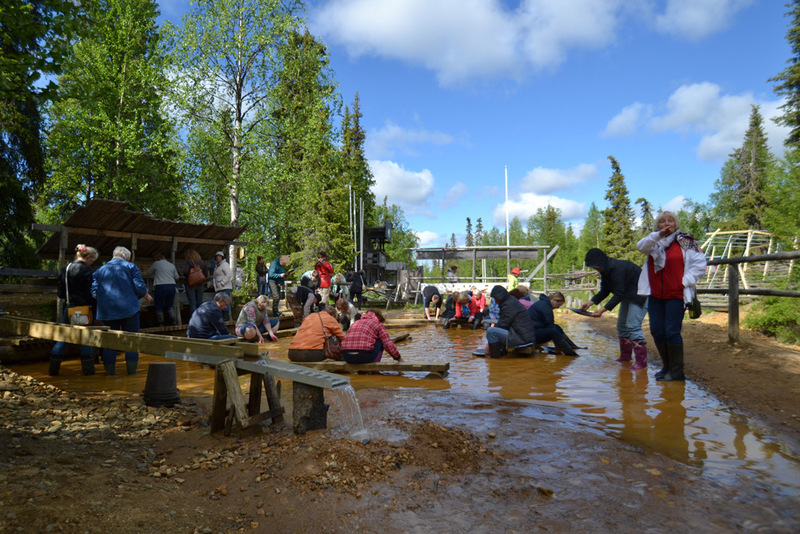 Experience the old gold rush times in Tankavaara Gold Village; Pan gold in our indoor panning site, all the gold and gemstones that you find are yours. Take a dog sledge ride around the Gold Village area and explore the mysteries of the world famous Goldmuseum. Finally relax by the fire in our restaurant and enjoy delicious lunch. Gold Rush Day starts with signup at the Gold Village restaurant, please have your ticket with you in either paper or mobile device. Then we will start the activities with either the 10 minute dog-sled ride or indoor gold panning. Afterwards you can take a short walk to the Goldmuseum. 3 course lunch is served back at the restaurant and includes starter salad, main course and waffle with ice cream and housemade blueberry jam as well as coffee, tea or hot chocolate. Our guide will drive the dog-sled, guests will sit in the sleigh. The short 10 minute dog-sled drive cannot be driven by yourself. Please note that our staff will give you tickets and all information with maps at the restaurant but you will need to walk 200 meters to the Goldmuseum and 50 meters to the dog-sleds where our staff will wait for you. Snow-gear and overalls are not included since most of the activities happen indoors.